Without an efficient management method, waste can accumulate fast. Skip bins are indispensable when you want to dispose of significantly large amount of waste material. Whether it is a small home renovation, spring cleaning, or a bigger job of removal of waste from commercial sector or industrial sector, skip bins at Big Bin Hire are very useful. Using our skip bins helps you save time and ensures a safe and clean environment at your work site, office, or home. With plenty of advancements in skip design, it is now possible to use them in almost any type of waste disposal related to works, such as demolition, renovation, clean up, landscaping and more. And this applies to shopping centres too. Using the right size and type of skip bins from Big Bin Hire will help maintain a clean, safe, and pleasant ambience and most importantly it will reduce the trips taken to discard trash. When there is waste littered all over your workspace, it can become quite messy and difficult to work. Hiring an appropriate sized bin will help to contain all the discarded waste. When you place skip bins at areas that are convenient to access, you can clear rubbish from the space, and keep it neat and conducive for work. When you hire skip bins from us, you can save the effort and money it takes to remove waste and dispose it in landfills on your own. You can cut down the frequent trips and save money that you spend on hiring an appropriate equipment or vehicle for disposing the waste. When you have minor renovation, construction projects, shop installation or regular cleaning work being done, there is bound to be a large amount of waste. This can hinder your work and also pose a safety hazard for people. With skip bins, the waste materials can be stored safely and disposed and you can avoid accidents. One of the advantages of using a skip bin hiring service is you can have a more flexible schedule than that offered by your local garbage collection service. You need not store away waste until the collection service arrives. You need to just place a call when the skip bins are full to dispose of the waste. Whether it is a short or long duration you are looking for, the hiring service can make the necessary arrangement. It is important and mandatory too to follow responsible waste disposal methods. Using a hiring service will ensure the waste you dispose of is sorted out in a licensed facility and salvaged appropriately for recycling, reuse or redistribution. This will ensure the waste does not merely become a part of the landfills. Clearances: Placement of the skip in an appropriate location that has enough access to place and remove the skip when needed is essential. You need to consider the height and width of the skip delivery truck, especially if the bins are to be placed in the basement with pillars or reduced height, or in driveways that lack the necessary dimension for the delivery truck to load and unload. Safe loading: Whether you are unloading the skip from the delivery truck or van, or loading it after it is filled with waste, you need to identify a proper location that has easy access. 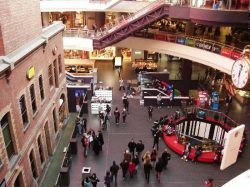 Make sure access to the shopping centre space is well-facilitated and according to the vehicle height and width restrictions in your location. The skip bin loading/unloading truck should be properly positioned for efficient and hassle-free collection and delivery. 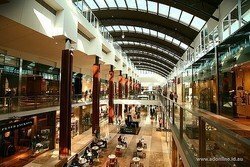 Working off-hours for convenient and safe loading: Shopping centres see plenty of traffic during the day. To avoid unnecessary hassle to shoppers, it is necessary to use hours other than peak traffic time for safe and convenient loading. Make sure the skip service is aware of the clearance restrictions and off work timings. Size of bins: Skip bins come in all sizes, ranging from small 4 cubic metre capacities to over 25 cubic metre bins. To ensure the safe loading and unloading of the skip bins onto your property, wheels are placed on the skip bins. This helps avoid damage to the surfaces they are placed on. Wooden planks as well as sheets also ensure the bins do not cause any damage. Most skip bin hire services including Big Bin Hire do not allow liquids, asbestos, hazardous waste or full paint tins. Gas bottles, needles, syringes, explosives and other eco-unfriendly materials are also not allowed. The limit on the waste amount you place in a skip bin is based on the size. The basic rule regarding the waste amount collected is a 1 cubic metre capacity skip can carry about 1 tonne. For larger skips, you have to ensure the bin is filled with lighter and bulky material and heavy waste to enable trucks to lift the bins and carry them. Make sure you do not overfill the skip past the top edge as it can hinder with loading and transport. In general, skip bins should be placed only on private land or property. Driveways present within property limits are ideal, if they are wide enough for the truck to enter. Ensure the placement and removal of the bin is not hindered by trees or power lines. If bins are placed on your property, you do not require council permit. But if you intend to place the bins on nature strips, public lands or laybacks you need a permit. The regulations differ based on the council your location belongs to. But ensure the skip does not block utility pits or pedestrian access. When you use Big Bin Hire skip bin hire service, the big hassle of waste disposal will be taken care of in the most efficient way. Make use of our reliable service in Melbourne to ensure your waste disposal needs are efficiently met. From a fast delivery to an efficient and hassle-free collection at competitive pricing, you are sure to be satisfied beyond your expectations. Call us now on 1300 224 473 to get a quote!